Way back in July 2010, I started a series of posts about the Ocean whisky lineage. This is the third part of that series and deals with the top-left tributary illustrated in the graphic above: the Daikoku Budoshu/Ocean story from the early Meiji period to 1960. It is a pretty difficult history to try to follow but the author of the Japanese-language Malt Whisky Blog has done a fantastic job of untying the knots and it is definitely worth looking into. The post below reveals a long-lost malt distillery called Shiojiri in Nagano and deals with the start of distilling at Karuizawa. I hope it will be of some interest. This part of the Ocean story has its source in the late 1870s, with the founding of one of the pioneering wineries of the early Meiji Period, the Kaitakushi Budo Jozojo in Sapporo. That name is quite significant in the early history of Japanese wine, but we can skip ahead to the early 1920s, by which time a successor firm was controlled by Kotaro Miyazaki (the first), was selling products under the “Daikoku ten” brand (since 1892), and had started to experiment with whisky production. The first whisky we know to be connected to the company was called “K.M. Sweet Home Whisky” and came out in 1922. According to the company’s publicity, the then Crown Prince Hirohito suggested, while visiting the Yamanashi distillery, that it would be a good idea to make a port wine. A port wine, a champagne and a whisky were distributed on the back of the suggestion. The “K.M” brand may have been based on Miyazaki’s initials. The push into whisky came after WWII, when the firm was controlled by Miyazaki’s grandson (through his first daughter), also called Kotaro Miyazaki. I will call him Miyazaki Jr.. He took over the firm in 1947, when the older Miyazaki died and it was under his stewardship that Daikoku Budoshu began to establish itself as a significant producer of whisky. In the late 1940s, set pricing of western-style spirits was abolished and, in 1953, a three-level classification system for whisky was introduced (“special” 1st class whisky, 2nd class, and 3rd class). The effect of the changes was to very significantly cut the tax on cheap blends, effectively democratising what was to become the iconic drink of post-war Japan but also putting back the cause of quality whisky by about half a century. The father of Japanee whisky, Masataka Taketsuru, was a vocal critic. The changes also abolished a regulation insisting on three years maturation for whisky. Japan has still not reinstated that legal requirement, although the big companies abide by the Scottish 3-year rule. In 1946, amid the chaos of post-war Japan, Daikoku Budoshu released its first “Ocean whisky.” It was competing in an extremely crowded market, with more than 30 whisky brands fighting for market share, but production expertise and equipment was thin on the ground. Few companies could actually make their own malt whisky and many of the cheap, 3rd-class whiskies that emerged in the 1950s actually had little malt in them at all. Ocean was initially produced from Daikoku Budoshu’s site at Shimo Ochiai in Shinjuku, Tokyo, and it is unclear what exactly was in those first bottles. By the early 1950s, however, Miyazaki Jr. had developed a strategy of marketing cheap, mass-market whisky with a good amount of proper malt in it. At first, Ocean whisky was using malt bought from Nikka Whisky’s distillery at Yoichi, Hokkaido, as well as malt from other makers like the Takara, Tokyo and Toyo distilling companies. However, in 1952, Daikoku Budoshu started trying to produce its own malt whisky at its Shiojiri site in Nagano prefecture. Shiojiri, one of Japan’s lost distilleries (I have never seen any whisky containing its malt on the modern market), continued operating until 1955. Akira Sekine, who worked at there from its first year, has left a candid account of the firm’s struggles to get its production going. The first problem was getting a government licence to produce whisky. Although Shiojiri could produce brandy and wine, it did not have the documentation to produce whisky, and the authorities were extremely restrictive about granting new permissions. It was only after a major lobbying effort that the go-ahead was given in 1952. There was only one pot still and Sekine said the initial spirit produced was not, in his opinion, worth maturing. There were a series of further technical problems: the well on which the distillery was relying for water ran out and a new, deeper one had to be dug. However, the water from that deep did not work well with the yeast they were using, forcing Shiojiri to start filtering the water before use. In the end, only about 250 kiloliters of 65 percent abv spirit were ever produced at Shiojiri. Sekine said its spirit was never satisfactory, but that it was used in Ocean’s blends. Ocean whisky moved to Karuizawa distillery in 1955-56 after a lobbying campaign by Sekine and some colleagues, who felt Shiojiri was not suitable for whisky making. The Karuizawa site, also in Nagano, had been used for grape cultivation since 1939 and Sekine was familiar with it because of his additional duties as a winemaker. Tests suggested that the mountain water there was ideally suited for whisky production and the spaciousness of the site made a move feasible. At first, there was no response to the proposal from the management, but Sekine and two colleagues then went directly to the firm’s top bosses and managed to push their idea through. The new Karuizawa distillery had four pot stills (2-5 to 4 kl) and did not start producing spirit until mid-February 1956, although there had been experimental production on the site before that. The next part of the jigsaw fell into place in 1958, when Ocean at last started to be able to source enough malted barley to sustain a substantial whisky output. Before 1958, the importing of malted barley was banned. Japan had a significant malting industry, with major maltsters including Nihon Bakuga Kabushiki Gaisha and Jinda Seibaku Gaisha, and some of the established whisky companies also did their own malting. Ocean had problems getting enough malt to feed its stills because, as a relative newcomer to the whisky market, its domestic supply networks were weaker than the other makers and its in-house malting expertise was nascent. It was trying to develop its that malting capacity, while relying on the big maltsters to keep it going, when new regulations in 1958 suddenly opened the door to importing malted barley. The initial reform tied the amount a firm could import the the quantity of domestic barley it also bought (more domestic barley, more imports). Karuizawa could therefore significantly boost production, with about 50 percent of its malt coming from abroad. Later, with the decline of domestic malt production, almost all of the malt for Karuizawa, and indeed all Japanese whisky distillers, began to be sourced abroad. (It still is.) By 1960, Karuizawa was producing a steady supply of high-quality malt whisky. Which brings us to the end of this first part of the Ocean story, except to mention that very soon I think Japanese whisky fans will being tempted by some Karuizawa 52-year-old whisky. By my calculations, that dates it to about 1960, exactly the point we have reached in the Ocean narrative. Someone in the know has told me the whisky in that bottling, which is due to be released very soon, is superb. The comprehensive research published in Japanese by the author of Malt Whisky Blog is the main source for this post, as well as the Akira Sekine accounts referred to in that research. "Carving out a niche (Karuizawa)" by Dave Broom in Whisky Magazine, Issue 51, October 2005, confirmed the history of Karuizawa as a winery. Yoshiba Katsuo, Budoshu to Wain no Hakubutsukan (Kankando, 1983), p. 151, is the source for the Miyazaki quote about the strategic advantages of fruit alcohol. My book, Drinking Japan, talks about Miyazaki's place in wine history. I created the river graphic. 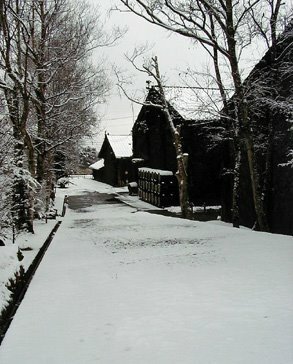 The image of Karuizawa in snow was taken from the distillery's promotional material. It's been a long time since i first read this article. And I was even more delighted reading it again today with more knowledge and experience. Two points I find really interesting here. - There may be karuizawa prior 1960. In fact the first one with "good barley" should be aroud 1958. I would really like a "part 2". Mostly want to know more about Yamanashi distillery. I always thought Hakushu was the first one in Yanamashi. 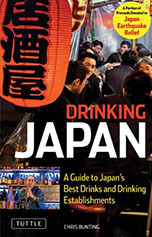 Chris Bunting's prize-winning book on Japanese alcohol. 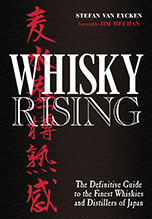 This site is probably the most comprehensive source on the Japanese whisky scene in English. It is also independent. No one who writes for Nonjatta is employed or paid by Japanese distillers and/or retailers. The current regular contributors are Stefan Van Eycken (chief editor), Ruben of WhiskyNotes (European whisky scene), Chris of WhiskyWall (US whisky scene) and the site's founder Chris Bunting. We have tasting notes on a wide range of Japanese whiskies, reviews, bar and shop reports, crib sheets, and loads of in-depth articles. Just take a trip down the side bars to get yourself acquainted. Kampai! © All rights are reserved on all written content, photography and other content on Nonjatta. Do read our complete copyright disclaimer. © All rights are reserved on all written content, photography and other content on Nonjatta. Awesome Inc. theme. Powered by Blogger.